Are you an artist looking to get the most out of your experience here in Houston? Become a Fresh Arts member! Fresh Arts is the only organization in the Houston area that provides up-to-date resources and low cost services specifically for the independent artist. 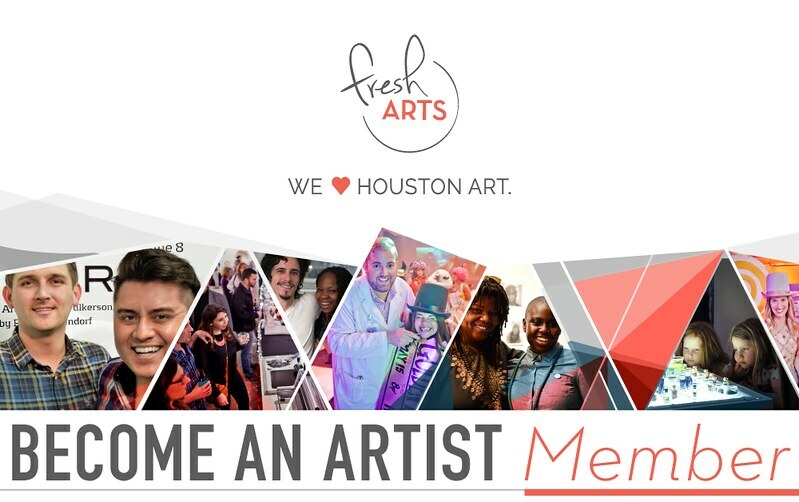 If you are an artist in Houston looking to get the very best out of the creative community, remember Fresh Arts has your back! An Artist Membership with Fresh Arts is only $50 annually. Fresh Arts members receive discounts at partner businesses including Copydotcom  and Skyline Arts Services . Fresh Arts members can attend the annual gala for 50% off and the Winter Holiday Art Market Friday night preview party for free. Prioritized presence and participation in an active and growing online community specifically designed for artists, arts administrators, and art fans. Featured profile/event placement in Fresh Arts’ weekly email newsletters. Featured mentions on Fresh Arts social media channels and public relations efforts. Free Associate Membership with Fractured Atlas due to Fresh Arts’ participation in an Open Arts Network. How much is membership annually? *Artist Memberships are $50 annually. When do I receive my member benefits? * Your member benefits begin immediately after you purchase your membership with Fresh Arts. When you log into your profile online, you will have Artist Member privileges, which will give you additional access to the site and allow you to make purchases with a member discount. * Your member benefits will expire a year after your purchase date.